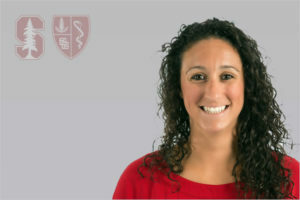 Katelin Knox, a California native, is an assistant athletic trainer with Stanford’s Sports Medicine Program. Katelin joined the Stanford Athletic Training staff after completing graduate school at University of Tennessee at Chattanooga. Katelin was first introduced to Stanford sports medicine while working basketball camps during summer breaks. She was drawn back to Stanford because of the standard of care provided and the emphasis on continual education and learning. At Stanford, Katelin’s primary clinical responsibility is with the Women’s Basketball and Women’s Golf Programs. She is also working on ACL research and intervention methods to help prevent injury through using motion capture technology to assess landing biomechanics.